Archivist Chris Lambert tells us about his choice for the first Document of the Month of 2016. This month’s choice is an unusual document that reached us recently from a local house clearance, thanks to some alert neighbours (Acc. A14346). What they rescued was a small bag of account books relating to a farming business at Little Saling, near Braintree. 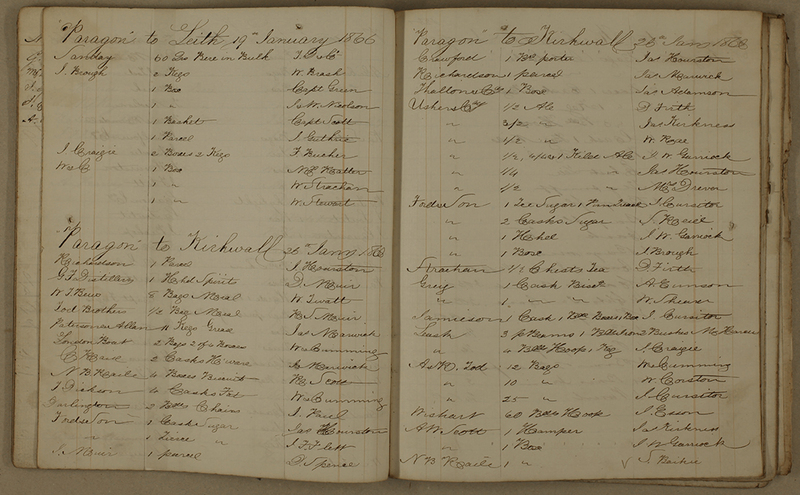 Amongst them was this exercise book, apparently bought in Leith, the port for Edinburgh, and used to keep accounts for the coastal trade, mainly in the 1860s. This opening relates to a vessel called the Paragon, which in January 1866 made what seems to have been a regular run between Leith and Kirkwall in the Orkney Islands. Many packages are not itemized, but with the names of both the sender and the consignee we still get a good picture of trade in the outer islands of Britain. On this voyage, the Orknies took considerable quantities of Usher’s ale, tea, sugar, biscuits, and a hogshead of spirits. And just what is this document doing in Essex? A loose note of 1880 gives us the clue, referring to J.D. Rendall of ‘Breckaskaell’ (the modern Backaskaill on the Orkney island of Papa Westray). 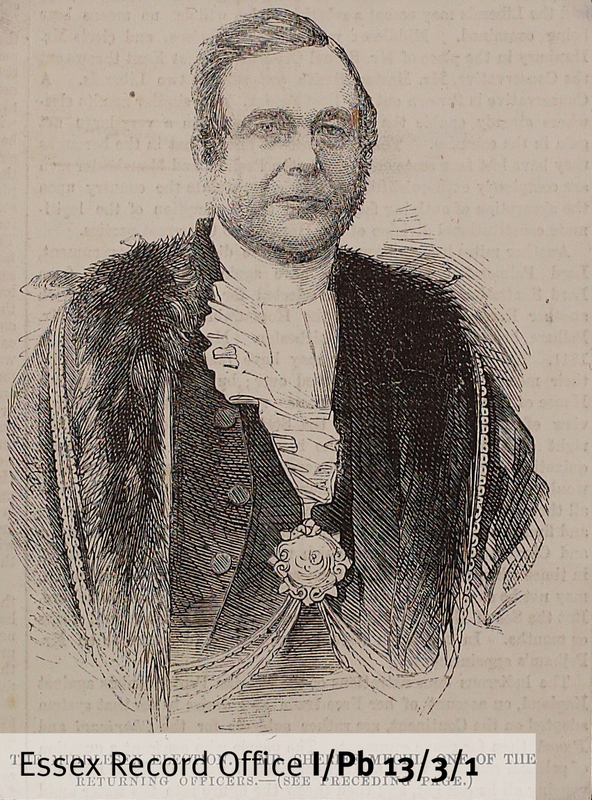 In about 1889, John David Rendall – born on Westray around 1836 – moved himself, his wife and children to Little Saling in Essex, buying Gentlemans Farm from its absentee owner. Rendall himself died in 1904, but his family stayed on the farm, part of that wave of Scottish farmers who helped to revive Essex agriculture after the depression of the late 19th century. Intriguingly, some other loose papers list ‘kelp made on the shores of Narness’, 1875-?1887. The use of fertiliser made from seaweed was hardly an option at Little Saling, but an interest in unconventional methods, and an eye for new opportunities, were just what Essex agriculture needed. The book will be on display in the Searchroom throughout January 2016. As episode 17 of series 5 of Great British Railway Journeys airs on BBC2 and Michael Portillo takes in some of the sights of our great county, we thought we would share some items from our collection to accompany his experience of oyster dredging on Mersea Island, and his visits to a model farm at Tiptree and to the world’s first purpose-built radio factory, Marconi’s in Chelmsford. 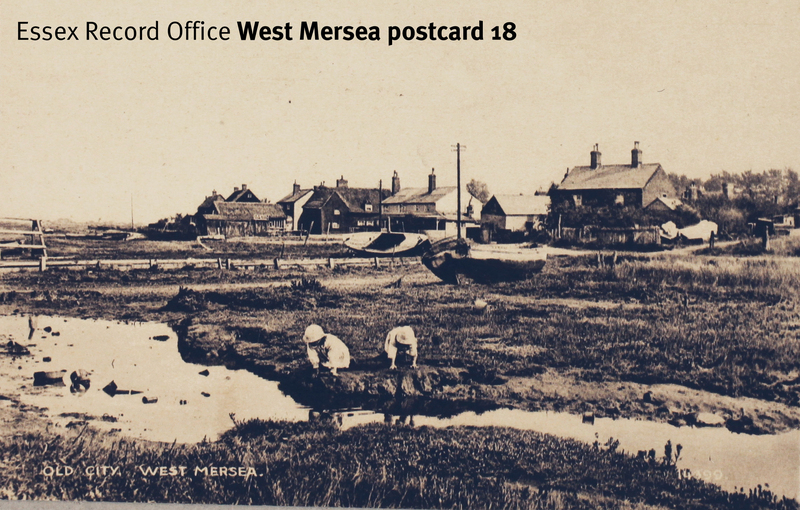 Mersea Island lies 9 miles south-east of Colchester, in the estuary of the Blackwater and Colne rivers. It is joined to the mainland by a causeway, and there is evidence of human habitation stretching back to pre-Roman times. Oysters have been gathered and consumed on Mersea for centuries, with oyster shells being found next to the remains of Celtic salt workings. The gathering of uncultured oysters gradually gave way to cultivation, and Mersea oysters were exported by the barrel load to Billingsgate Fish Market in London, and further afield to the continent. Competition amongst oyster gatherers in Essex has sometimes led to outbreaks of violence; during the reign of Edward III for example, a disagreement between men from Brightlingsea, Alresford, Wivenhoe, Fingringhoe, Mease, Salcott and Tollesbury over fishing rights resulted in the drowning of three men. Mersea Museum’s website has several great historic photographs of the Mersea oyster trade, such as this one, of members of the Tollesbury and Mersea Oyster Company men outside the Packing Shed circa 1908. Before broadcast, we are making an educated guess that the ‘model farming establishment in Tiptree’ is the farm set up by John Joseph Mechi (1802-1880) in the 1840s. Mechi, having made a fortune as a razor-strop manufacturer, decided to turn his attention to farming and apply his talents to the improvement of agriculture. In 1841 he bought 130 acres of poor, wet heathland in Tiptree, in one of the least productive districts in Essex, and proceeded to improve it by such means as deep drainage, removing hedges and trees, redesigning buildings and the use of steam-powered machinery. He persevered until his model farm turned a handsome profit. Mechi was exceptional amongst agricultural improvers for publishing details of his experiments in books, pamphlets and newspaper articles. He even published annual statements of his farm’s income and expenditure, explaining his failures as well as justifying his successes. His well-known publication How to Farm Profitably (1857) had, in various forms, a circulation of thousands of copies. Sadly, his career ended in disappointment, as the failure of his banking interests deprived him of the funds needed for his style of farming, and this, together with the effects of several bad seasons at Tiptree Hall Farm, led to the liquidation of his affairs shortly before his death. Tiptree Hall Farm one year after Mechi designed it. The main buildings are on the north and east sides, giving shelter from the coldest winds. The barn contained a horse-powered threshing machine. When not driving the threshing machine, the horse gear could be used to drive a chaff-cutter or corn mill. Within a year Mechi had decided to exchange horse power for steam power. Guglielmo Marconi established the world’s first wireless factory in a former silk mill in Hall Street in Chelmsford in 1898, when he was aged just 23. 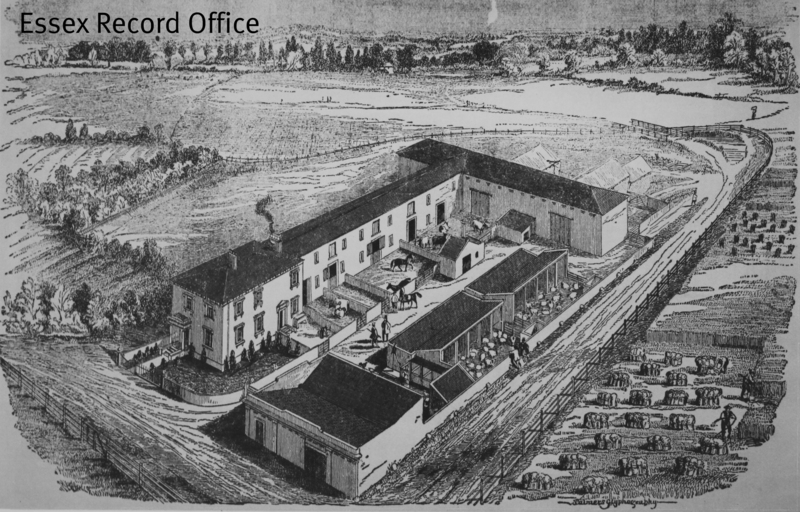 Chelmsford was chosen because Marconi needed electrical power, and in the 1890s Chelmsford was the place to be for electricity, thanks to the pioneering work of R.E.B. Crompton and Frank Christy. 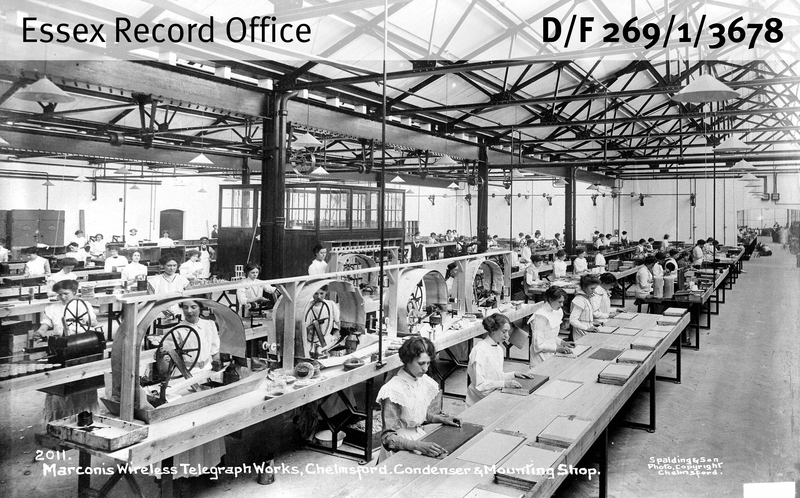 In June 1912, a replacement 70,000 square foot purpose-built factory was opened in New Street. The factory was completed in an astonishing 17 weeks by a workforce of over 500 people. The factory provided employment for thousands of men and women; although the machine shop remained the preserve of men, women were employed for the more delicate aspects of the production of wireless transmitters. Marconi wireless equipment was used by ships and coastal stations to communicate with one another in Morse code. During the First World War, operators at New Street intercepted German radio transmissions for the British government, and Marconi engineers also developed the technology for ground-to-air communication with aeroplanes. During the Second World War, Marconi’s played a crucial role in the development of radar. After the First World War, engineers at New Street began to experiment with wireless voice transmissions. The first publicised entertainment broadcast in Britain took place at the factory in June 1920, when Dame Nellie Melba performed. Her singing could have been picked up anywhere across Europe by someone with receiving equipment. By 1931 there was one wireless licence for every three homes in the country. Shortly after the New Street factory opened, local photographer Fred Spalding took a series of photographs of the new facility. Click here to view more of the photographs from a previous blog post. Check back here tomorrow for more to accompany Michael’s visit to Tilbury. 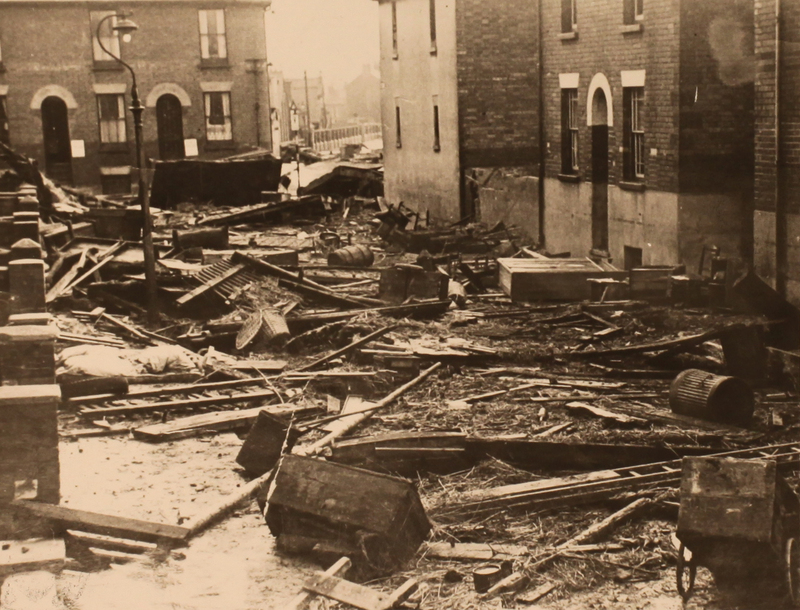 On the night of Saturday 31 January 1953 a severe storm coincided with a high spring tide in the North Sea, and the resulting tidal surge caused great devastation all along the east coast. In eastern England 307 people were killed, 120 of them from Essex. The worst hit communities in the county were Canvey Island, where 58 died, and Jaywick, where 37 people were killed (5% of the population). A major operation was mounted to rescue as many people from the flooded areas as possible. Along the east coast of the UK, 30,000 people were evacuated from their homes. Damage was caused to over 1,600 km of coastline, as well as to thousands of homes. It is estimated that the damage in monetary terms today would be over £5 billion. It was of course not just England that was affected by the floods; 19 people died in Scotland, 28 in Belgium, and a staggering 1,836 in theNetherlands. Over 230 people also died on ferries, fishing boats and other vessels which were in the North Sea that night. 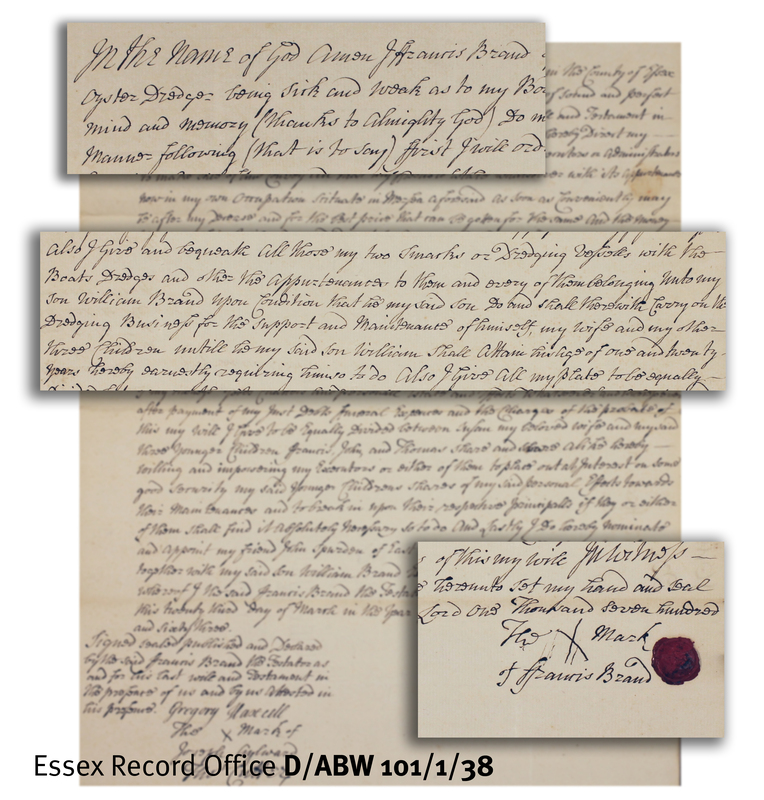 We have been going through some of the many documents in the ERO which tell some of the stories of the floods in Essex, a small sample of which will be on display in our ‘Document of the Month’ case in the Searchroom throughout February. Canvey Island underwater (D/Z 35/15) (Photo: Southend Standard). Photograph of the junction of Albermarle Street and Alexandra Road in Harwich. The flood in Harwich was described as a two metre high wall of rolling water. Eight people drowned trapped in their basements in Main Street (T/Z 241/1) (Photo: Harwich and Dovercourt Standard). 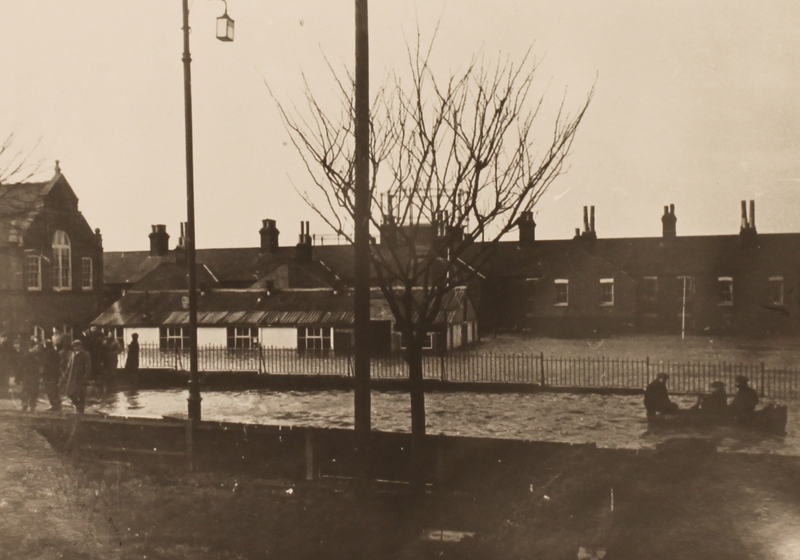 The ground floor and playground of Harwich Junior School were flooded to a depth of 1½ metres (T/Z 241/1). This note in the Harwich police station telephone log tells us that at the army base on Bramble Island, near Harwich, the magazines had been breached by the flood waters. 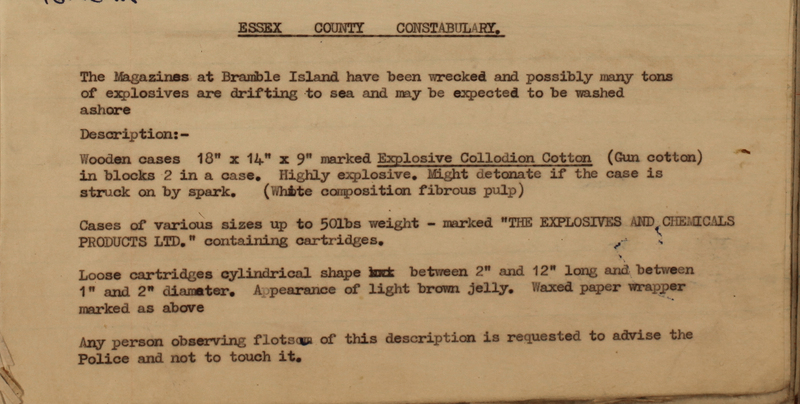 High explosives had floated away and the police and public were advised to be on the look out for them, and not to touch them (D/Z 35/6/1). 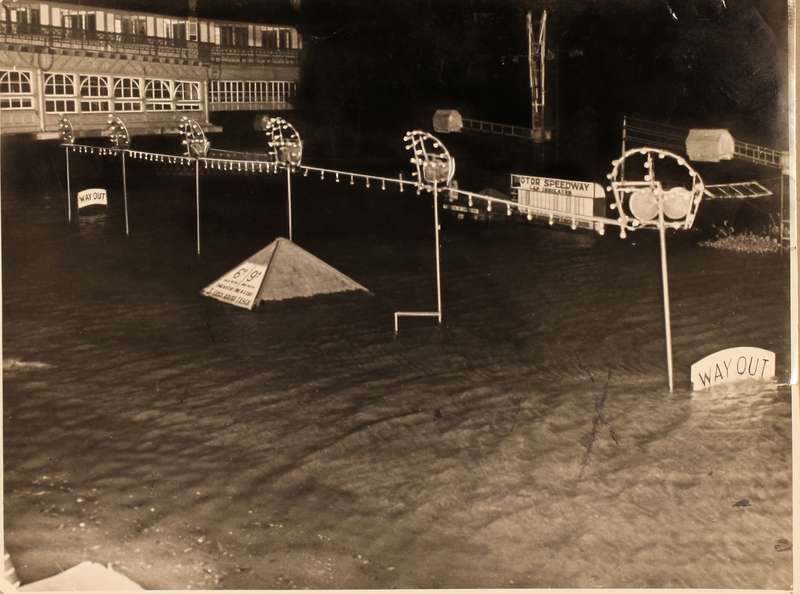 Photograph of Peter Pan’s Playground, Southend (D/Z 35/15) (Photo: Southend Standard). At Southend the effects were not as severe as at Canvey. 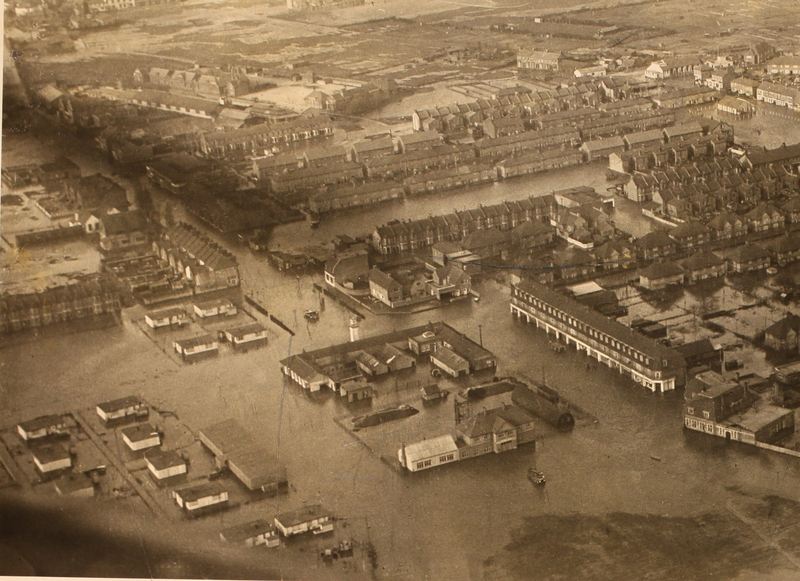 The Kursaal flooded, along with the Gasworks and Southchurch Park. 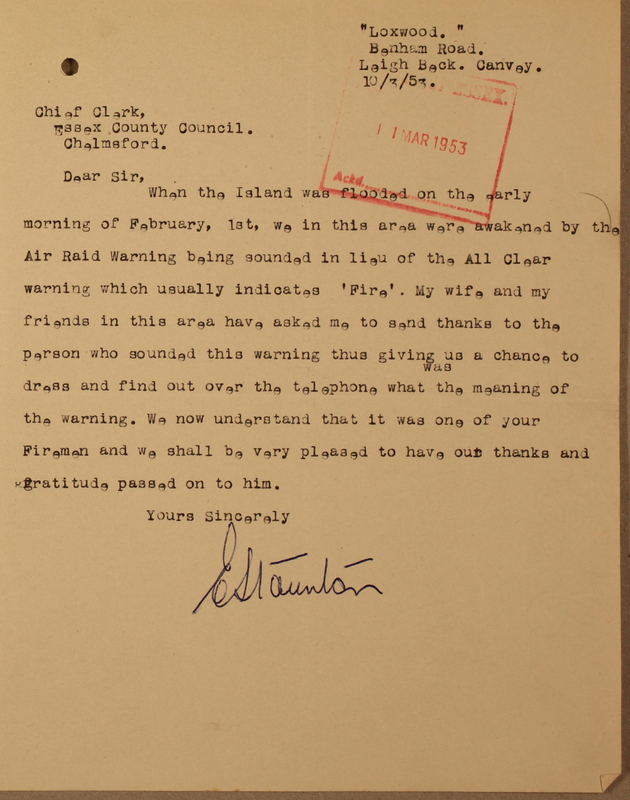 Letter written month after the floods by Mr E. Staunton of Benham Road, Canvey to Essex County Council to pass on the ‘thanks and gratitude’ of himself and ‘friends in this area’ to the fireman who sounded the air raid siren ‘thus giving us a chance to dress and find out over the telephone what was the meaning of the warning’ (C/DC 11/Fd43). A selection of these documents will be on display in the Searchroom throughout February. Others can be ordered to view in the Searchroom. Find out how to visit us. 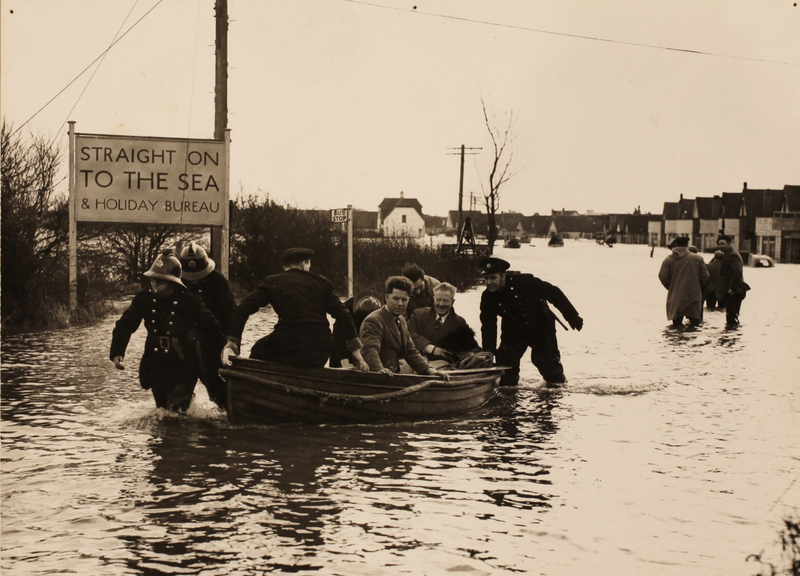 To find out more about the floods, why not go to hear Patricia Rennoldson Smith talk about her new book The 1953 Essex Flood Disaster: The People’s Story as part of the Essex Book Festival.